Many craft beer enthusiasts have a tendency to hyper-focus on what is new and with so many new beer releases it is easy to try entirely new brews every time you grab a beer. I can be guilty of this on occasion, sometimes I need to remind myself to mix in a few old favorites. This presents a challenge for bigger craft breweries that already have a large number of beers in regular rotation. As these breweries introduce new beers should they also retire some of their older/less popular brews? Stone Brewing Company recently announced that they were retiring a few of their year round offerings including their amber ale Levitation and their black IPA Sublimely Self-Righteous. While these beers were popular with some drinkers, their sales didn’t justify continuing year-round distribution. I thought it would be appropriate to drink and review Sublimely Self-Righteous before it becomes much harder to find. Stone first brewed this black IPA to celebrate their 11th anniversary in 2007 and it became part of their regular rotation in 2009. The last bottling will be in April, so you have a few more months to try the beer before it is gone. 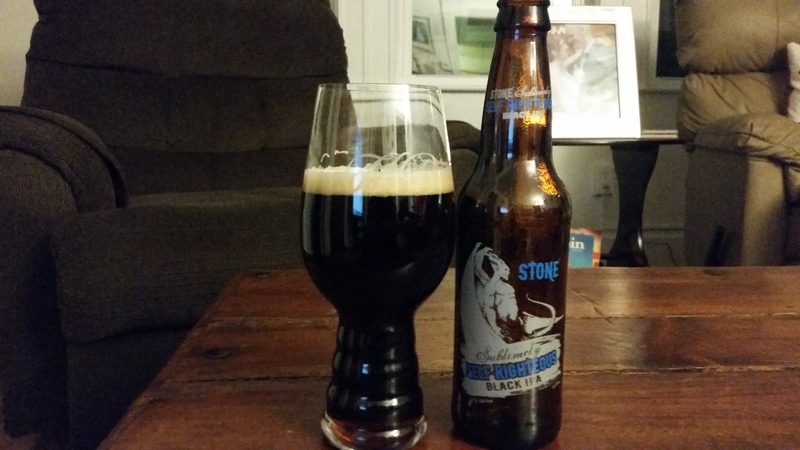 Stone Sublimely Self-Righteous pours midnight black with a moderate tan head. The scent is very hop-forward, a mixture of floral, citrus and resin aromas. The taste is also extremely hoppy, notes of pine, cut grass and lemon. This is accompanied by aggressive bitterness, Stone tends to be in-your-face and this beer lives up to their reputation. The malts are present in the flavor, touches of unsweetened chocolate and strongly brewed coffee that complement the pungent and bitter hops. The beer is medium bodied but drinks like a heavier beer due to the full flavor and bitterness. It is also by no means a light beer weighing in at 8.7% ABV. Overall this is a solid version of a black IPA, a good beer but not my favorite from Stone. I can understand why they want to shelve this recipe in favor of some of their newer creations, but if you are a big fan of the style you should try this one before it’s gone. Hoppy Boston score: 4.0/5. Previous PostClown Shoes The Peace That Money Can’t Buy Next PostIf you could have 3 readily available beers perpetually on draft at your house, which would you choose?